The heater is completely weatherproof and is suitable to be used outdoors in any application; it is perfectly safe to be used in the rain and continues to work even when subject to water jets. 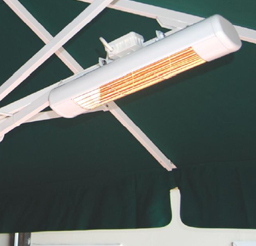 The heater can be wall mounted, overhead mounted or fixed under the parasols or awnings. The heater combines a robust character with excellent design, making the product ideal for both commercial and domestic applications. The white cover will look great with our awning models. For safety the heater is fitted with an attractive stainless steel finger guard for increased heat output compared with glass fronted models. The lamp is also replaceable. "The heater looks very cheaply made for the amount of money paid. Does throw out some heat but nothing compared to a gas patio heater. We will see how it performs."